Who doesn’t love long weekends? Especially at the end of one of those weeks where you seem to be shot at from all sides as you pull your helmet of fortitude firmly down your head, dodging bullets and avoiding potholes, hoping that you reach your bunker in one piece. Yes, especially then. But even when everything is fine and dandy, a long weekend is still something welcomed with your biggest grin and hugged tightly to your chest as you enjoy every single moment. Many times we like to plan a trip out of town when such a blessing comes our way. Nothing fancy necessarily. Perhaps a nearby beach or a place higher up with a great view and a slightly cooler climate. This time though, maybe because I just came back from a trip out of the country, maybe because the weather was rainy and gloomy and just so conducive to staying put, we decided to forgo any trips and just…burrow. Of course, we didn’t just burrow for three days (although I’m sure I could be found capable of doing just that). With a nice long patch of time before me, a taxing week behind me, and rain pitter-pattering on the windows, I did what seemed but natural to me. Therapy. Tomato sauce therapy to be exact. – Heat a couple of generous glugs of olive oil in a heavy-bottomed pot or pan. – When the oil is hot add the onions, garlic, and bay leaf and sauté until the onions are soft and translucent. – Add the tomatoes and stir. Let this simmer, uncovered, until some of the water has evaporated and it is thick and pulpy, about 20-30 minutes, stirring occasionally. It may take longer…be patient and you will be rewarded. – At this point taste and season with salt and pepper, and sugar if using. Add a couple of swirls of extra virgin olive oil and stir. Let this simmer for a further 10 minutes. Taste and adjust seasoning as needed. – If you are using fresh herbs add them now, toss in the sauce, then take off the heat. – You can use this immediately, store it in the fridge for 4-5 days, or in the freezer for 3-6 months. You can use this sauce as is; tossed with some pasta and a dusting of freshly grated parmesan, and you will have a completely satisfying bowl of pasta in red sauce. It can also be used as a base for many other pasta sauces. Add sautéed shrimp, bacon and chilies, minced beef, anchovies & olives, clams, eggplant & white cheese…the possibilities are limitless. And by no means is this just for pasta. You can use this as a pizza sauce, a base for cooking fish or chicken, for baked veggies topped with a crumb and cheese crust, even as a bed for an egg cooked “en cocotte”. You can experiment with different spices as well…I love this with a good amount of (my favorite) pimenton de La Vera (which I’ve just restocked…yay! ), which makes the sauce nice and smoky. The long and short of it is that this is a great to have stashed in your fridge. I used herbs here as I had some fresh oregano from my organic farmer and I happened upon some sprightly basil in the market. You can leave them out for a plainer sauce and that’s why I’ve listed them as optional. Some people like to add a bit of sugar to a tomato sauce and I add about half a teaspoon here (it doesn’t so much make it sweet as rounds out the acid of the tomato), but you certainly don’t need to if this is against your tomato sauce principles. You also don’t need to use as much garlic as I’ve specified – I like my sauce quite garlicky but you can use less if that would be more to your taste. I don’t use fresh tomatoes because the tomatoes available locally aren’t always the best for a nice rich sauce. If you haven’t got the perfect tomatoes you are better off using quality canned ones rather than the wrong fresh ones. So buy the best you can manage – I’ll usually gravitate towards an Italian or a Spanish brand. A gently gurgling pan of red pulpy tomato goodness on the hob, stirring and nudging occasionally with a wooden spoon, and finally scooping it all contentedly into a jar – it’s not much, perhaps not a day in the spa, or a trip to get away from it all, but ah, what it does for the soul! Super awesome! I am loving this tomato sauce! Hi, I'm a new reader and just love your blog and writing style! And the pictures of food are beautiful. Yum, I love the color it looks so rich and delicious! 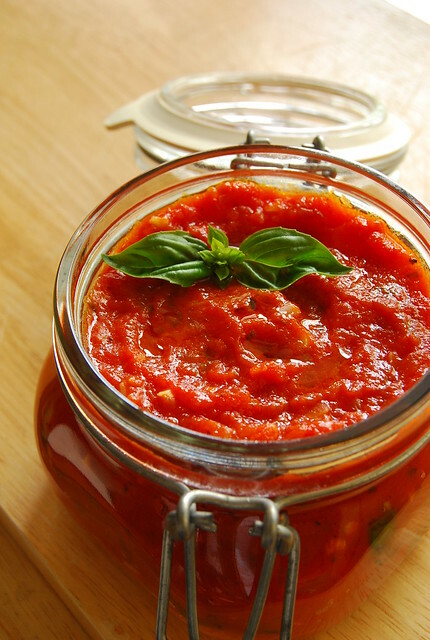 Having a recipe of a good tomato sauce is so vital! It's the basis of so many wonderful creations. This one I am truly loving! totally adding you to my bloglist – good inspiration for cooking. Gorgeous, gorgeous tomato sauce, Joey! It looks scrumptiously ALIVE for some odd reason; I guess it's the vibrant color and I can imagine the freshness of the flavor. Thanks Annabanana! It’s very simple to make! Hi Maria! Thank you for your nice words 🙂 Glad to have you here! Hi Midge! Oh my! He is even more adorable now!! oh I love that color of the tomato sauce! Being a pasta addict, this post literally called out to me:-). It's been a while since I made some tomato sauce, and I think this weather calls for some hearty bowls of pasta. Thanks for the inspiration! Btw, there's no shame in adding a bit of sugar to tomato sauce while cooking… You're right, it really does take some of the "edge" off it:-). Hi Pille! We just pass it (the summer) to each other 🙂 Enjoy your summer! love lots of garlic in my tomato sauce too! This is perfect!! Who doesn't love long weekends especially when cooking something amazing is included! This is perfect for when I don't have a lot of time…beautiful and inviting color! Perfect when tomatoes are at their best. This sounds so tasty! Thanks Paz! I hope you like it! Hi Ash! I know…they don’t happen often enough for me! Hi Mama Mia! I really cook it down until it is thick and pulpy…patience is a virtue! mmm…sounds fabulous! i just LOVE homemade tomato sauce. thanks for the recipe! Hi Cailen! You’re welcome…I love it too! Hi Why Just Eat! Thank you 🙂 Hope you enjoy it!